On the heels of its May announcement of a powerful job search tool — Google for Jobs — the company today publicly released an ATS designed for small- and mid-sized businesses. Google Hire integrates with its widely-used G Suite, enabling recruiters and hiring managers to conveniently filter applicants, capture their contact information, communicate with them, schedule interviews, and manage the process from a single location. Track candidate pipelines in Hire, and then analyze and visualize the data in Sheets. That’s just a sample of Hire’s features. The Hire page notes that from the Hire app employers can also create job postings and upload them to Glassdoor, Indeed, and Google, where jobseekers using Google for Jobs can easily surface them when conducting a search. Those are the only three job search sites currently enabled. All tracking systems, including most of the freemium ones, have similar features. However, the data lives in those systems. Integration with standard office tools like email and word processing and collaboration can be more or less difficult — or almost impossible without paying sometimes substantial fees. Hire, however, is an app that works with G Suite, a group of Google tools that include Gmail, Calendar, Google Drive (its cloud storage), and cloud services such as word processing, spreadsheets, and the video communications Hangout. According to Google, three million businesses are G Suite customers. Only G Suite customers can use Hire, for which there is an additional charge. The pricing for Hire is not listed. Potential customers must fill out a contact form for a demo and other information. Google’s Hire goes well beyond what most of the basic tracking systems used by small and mid-sized businesses offer. Perhaps its most powerful feature, besides the convenient integration, is that it uses Google’s search. For starters, candidate data is supplemented by Google Search which surfaces links to their profiles from sites such as the patent database, LinkedIn, and GitHub. Finalist candidates — “silver medalists” Google calls them — who either didn’t get the job or rejected an offer, are easily resurfaced. 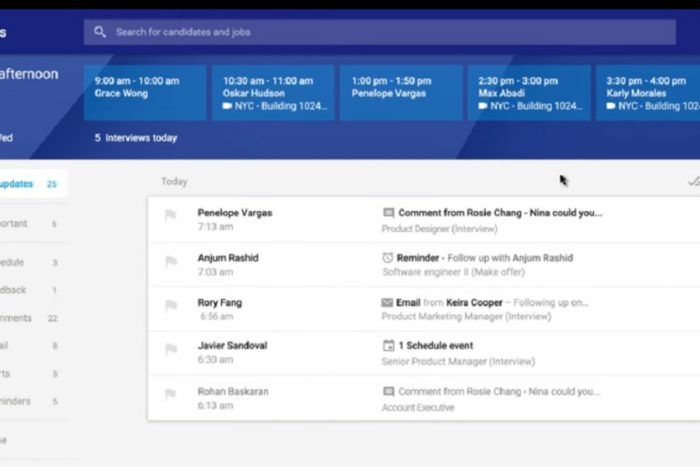 Collections, a Hire feature, simplifies organizing these or other candidates into special lists allowing recruiters to create personalized pipelines. There are a few things Hire’s product pages don’t mention. Everything can’t be said, of course, so it’s possible, even likely, that features such as company career sites and landing pages may be part of the package. There’s also no mention I could find of how Hire handles attachments. Most candidates send resumes in Word or as PDFs; Google being Google it knows that and presumably has no problem searching them. The Hire product page says jobs can be posted to “major job boards — like Indeed or Glassdoor — and to specialized ones too.” And there’s a process in the help center explaining how to set up the other sites. Curiously, Indeed, Glassdoor, and Google search itself are the default choices. There’s no explanation why other major sites like CareerBuilder, ZipRecruiter, and others aren’t listed. I emailed these and a few other questions to Google’s press office. Have yet to hear back.